Rich Haas has over 20 years of experience in the international moving industry, and has been at Rainier since 1999. What makes Rich tick? Being able to meet people from many different countries and having a large network of agents and vendors who help him get information quickly for his clients. Rich understands that timely information can help ease the stress of relocating overseas. Rich remembers being stressed just moving across the hall in college, so he feels great when he can move someone to the other side of the globe stress free. In Rich’s spare time, he enjoys being outdoors with his wife and 2 sons, and attending his kids’ Taekwondo events, swim practices, and school events. 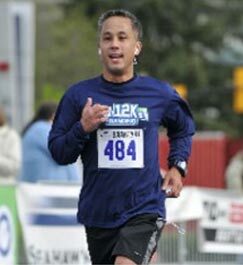 Rich, also a long distance runner, recently completed 2 marathons in a 3 week period.